Mailroom vendor Ferag says existing inserting equipment of theirs which had been upgraded between 2010-2013 at Coldset Printing Partners in Paal-Beringen - now part of the Mediahuis media group - is being reconfigured and new elements added. The site - about 80 km east of Brussels - was established in 2010 as a joint production facility for media companies Corelio and Concentra, and currently prints titles including De Standaard, Het Nieuwsblad, De Gentenaar, L'Avenir, Gazet van Antwerpen, Het Belang van Limburg, De Limburger and Metro, totalling about 600,000 newspapers a night. Five production lines replace the original four three-tower KBA Commander lines, which are being reconfigured, with only seven of the previous 12 towers remaining - as two 64-page and one 96-page line - and two new Cortina waterless presses, each with two towers and a folder for 64-page tabloids, being added. Following the merger and under the direction of chief executive Paul Huybrechts, 20 year-old insertion technology had been replaced with three Ferag MSD inserting drums and a quarterfold line introduced. 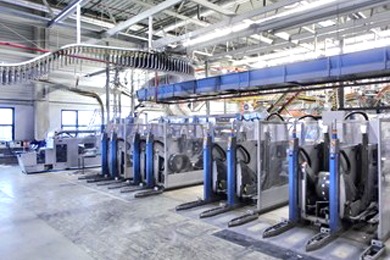 Now with five production lines with five folder deliveries, an additional postpress processing line is being added, along with a second quarterfold line, capable of covering the Cortinas' variable 1200-1620 mm web widths for Nordisch, Rhenish and Berliner, and magazine formats. Processing is traditionally offline but press specific. One Commander line has an existing - and now lightly-used - ETR inserting drum refurbished, but a newly-acquired MultiSertDrum inserting system is being installed behind the Cortinas, the fourth of its kind in the CPP mailroom. A DiscPool system is being enhanced for the Cortina lines, and additional bundling capacity added with two further MultiStack stackers bringing the total to ten bundling lines.